implausibility of gnus: Norman Rockwell might have dreamt this..
have to admit, i miss Labor Day weekend back home in Brooklyn just a little bit. the music, food, and even the un-wanted/invited house guests always made for an interesting end to the summer. however, spending Sunday afternoon knitting and watching movies is not a bad way to pass some time. 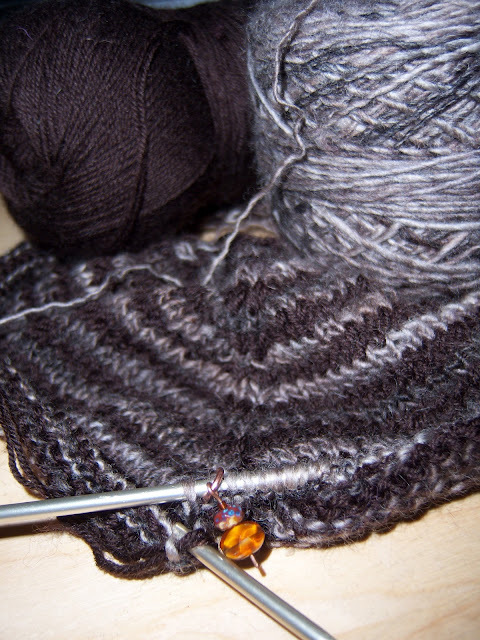 i've paired my hand-spun "guinness" (right) with a dark chocolate wool/cashmere blend (left) in what is already shaping up to be my new favorite scarf. that cute little stitch-marker... that's also my handiwork. happiness!